Not so much in this last entry of the series, of a certain place or a certain activity during my trip to KaoHsiung this year. More so of a peculiar discovery in the hotel room at Eda World. 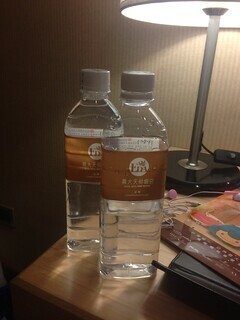 As with all hotels, there are the two complimentary bottles of drinking water. This hotel is no different as I reached out my hand to grab one of them. However, as soon as I got hold of one of them, something was not right. 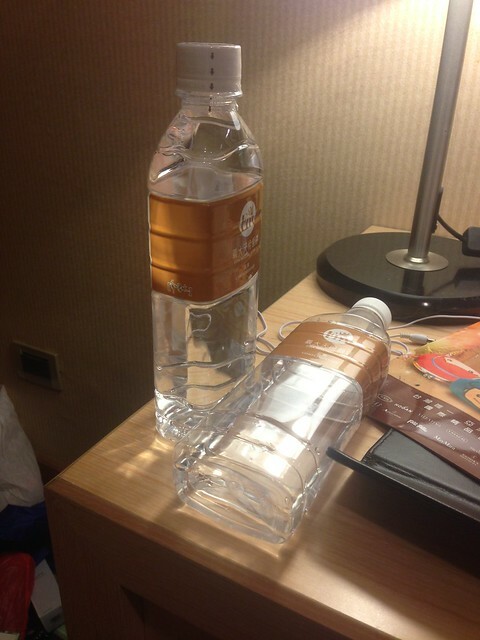 Why the bottle so flat one? What happened to the other half of the bottle? It's only water. Why so cheapskate one!! It left me with a sour after-taste to skim on this for this is something with such a low intrinsic value. Don't be like that. It could just be that they either noticed most people throw away unfinished bottles of water or they make it easier for guest to bring it around the damn big eda grounds. besides, they didn't say you couldn't call room service and ask for more water right? Passerby A: Yes. Concede the points where there are people who cannot finish the bottle or too troublesome to bring around. I would have preferred if they just offered smaller bottles instead of trying to create the "illusion" that it's a regular sized bottle.